Combine the chichken broth, pineapple juice concentrate and ginger in a small bowl. 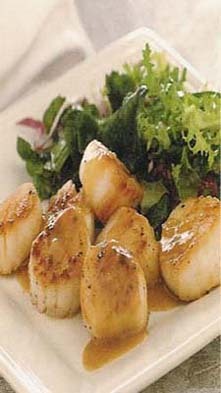 Set the scallops on a plate and drizzle with the oil; turn to coat. Sprinkle both sides with salt and pepper. About 2minutes before searing the scallops, set a heavy-based 12 inch skillet over high heat and turn on the exhaust fan. When the pan is very hot, add the scallops. Cook over high heat until they develop an even, rich brown crust, 2 to 3 minutes per side. Remove from the heat and transfer the scallops to a plate. Return the empty skillet to the heat and add the pineapple juice mixture; boil until the liquid reduces by about half. Tilting the skillet so that the reduced liquid is at one side of the pan, whisk in the butter. Spoon a portion of sauce over the scallops and serve immediately.